It is the beginning of a new month! December already! I put up my Christmas tree last Saturday and couldn’t believe that another year has almost passed. But before that time comes, I have another shop my stash for you. This is the makeup I wore this past month. Lorac Pro 2 eyeshadow palette – For eyeshadow I went with some oldies but goodies this month. Now that there is no lighting in the mornings and I have tried most of the eyeshadow palettes I purchased this year, it means I can go back to some of my old favorites. Lorac Pro 2 is one of them. Lorac is one of those brands everyone used to rave about, but lately they seem to not get as much hype. Such a shame, because their eyeshadow palettes are super pretty and easy to work with. I wore the nave & silver from the palette when I used this and really liked the look I came up with. Clinique Even Better Glow foundation – A brand new foundation I finally started using more last month was this one by Clinique. I was afraid it would be too dark, but in the end it turned out to be a good match. It is a very easy to wear foundation that looks natural and is exactly what I like in a foundation. Catrice Prime and Fine Fixing spray – There are plenty of products here that you will have seen before. This setting spray is one of them. It is cheap and cheerful and it works really well. I like it almost as much as my Urban Decay All Nighter and this only costs 4 euros. Tarte Amazonian Clay Blush Seduce – My blush of choice this month was Seduce by Tarte. This is a very pretty blush that is quite neutral and thus goes with everything. It is one of the best blushes I own for this time of year and it is just a great product overall. Hourglass Ambient Lighting Bronzer – I reviewed this bronzer just yesterday and I really like this too. It makes for a great natural bronzed look that doesn’t look too much. Of course it is expensive, but I have never found a bronzer this good. NYX HD Banana powder – This powder was already in my previous shop my stash and the pan is getting bigger as we speak. It is a really good powder that doesn’t look cakey and lasts really well. NARS Soft Matte concealer – Concealer wise I went with quite a heavy coverage one. I really wanted to give this a good try now that it really suited my skin tone and skin needs. I bought it last winter but knew it was a bit too heavy then on my winter dry skin. But once I figured out how to use this, it looked really nice on. MAC Paintpot Painterly & The Body Shop eyeshadow no. 13 – Are you sick of this combo yet? This will definitely be a combo you will see for a long time to come. The paintpot is nearly finished: it is on its last legs and I hope to finish it before the end of the year. I already have a backup lined up. Catrice Fresh It Up Hydrating Primer – This primer has been my favorite since I started using it last September. Again, a product that is on its last legs, but I really enjoy this. It is very hydrating and works really well under makeup. Maybelline Brow Satin pencil – Brows wise this pencil was one I was happy to use up on the last day of the month. It is quite a thick pencil and that is why this lasts a long time, but I think it is a bit too warm and I will not be repurchasing this. Catrice Brow Tint – I started using this to try it and I hope to review it soon as I am now using another Catrice brow product and that will be a 2-in-1 review. L’Oreal False Lash Wing mascara – A product I also used up this month is this mascara. This is one of my favorites and I am sad to say this is no longer available. I have one more left, but have plenty of other mascara lying about to try. Milani Eyeshadow primer – There are plenty of products that are nearly gone and this is another one. I think this is still a great product, but I am looking forward to moving on to something else. Urban Decay Vice Lipstick Liar – Last summer I decided to purchase some more Urban Decay Vice lipsticks as I really like the ones I already had. I bought Liar and it has been a great neutral color that goes with many different looks. A full review will be up tomorrow. NARS highlighter Fort de France – The last product I wore a lot last month is this highlighter and I’m in love. But since it is quite new I am still holding off on doing a full review because I need to gather my thoughts a bit more. 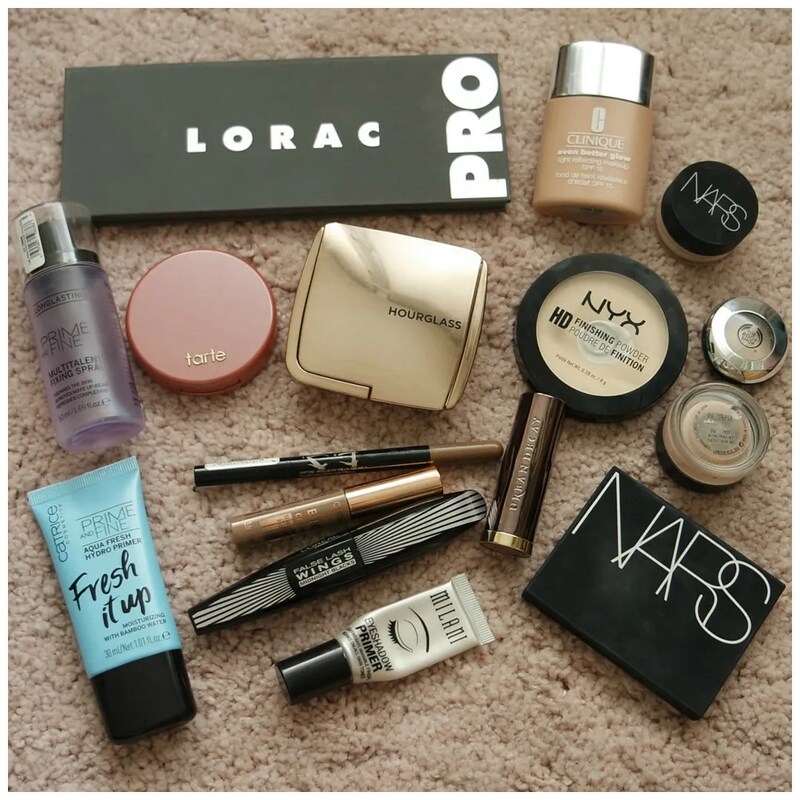 What makeup have you been wearing? They are really nice. I have reviews up for both if you are interested in reading more. gonna check out the UD vice lipsticks! i always see them in sephora but I’ve never given them a shot! They are awesome, I have a review up of a few shades today, so please check it out if you want to. Love Clinique even better foundation, did not know about this glow version! It is really nice! If you prefer a dewy finish foundation I’d certainly try it.